Perched slopeside, you'll have Instagram-worthy mountain views. The indoor/outdoor combo keeps your whole crew happy. You'll feel like semi-royalty, surrounded by plush, old world elegance. Enjoy. Be thee warned, after a day on the mountain, requests for thirds are not out of the question. Go around and have everyone tell their day's highlight (or hilarious lowlight that likely involves some sort of epic wipeout). 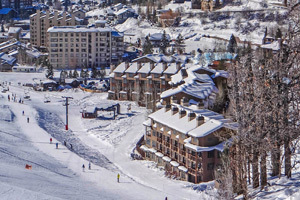 Steamboat Ski Resort is an easy 7 minute walk away. Prepare yourself for a day of winter fun! Go for a relaxing swim in the heated outdoor pool. Stock up on snacks, Spring Creek Trail is a 9 minute drive and the trail at Emerald Mountain is just a few minutes farther. Perfect your swing at Rollingstone Ranch Golf Course, just 4 minutes drive away. When you arrive at the Highmark, you’ll immediately be greeted by friendly staffers famous for their above-and-beyond service. The lobby fuses old world elegance with western luxe touches – think antique candelabras and tufted leather seats alongside cozy fireplaces and wood paneled walls. Impress everyone with your foresight, and purchase discount lift tickets through Guest Services beforehand, and they’ll be waiting for you upon check-in. Gondola Square is a mere five-minute walk across the street, even with little ones in tow. And with complimentary ski valet, you won’t even need to make the trek loaded up with skis, boards and boots. Just stroll on over whenever you feel like it, and gear up at the base of the mountain. Your crew will be hitting the powder in no time. Steamboat Ski Resort has a world-renowned ski school for novices young and old, and tons of great runs for riders of all levels. Grab lunch between rides at the Slopeside Grill, but be sure to wrap up those last few bites by 1 pm. Because that’s when former Olympian Billy Kidd holds his daily free clinic – just meet at the top of the Heavenly Daze run to join the local legend for a downhill ride! Once everyone is thoroughly snowed out for the day, unload your gear and return to the Highmark for some luxurious downtime. Soothe your weary limbs (signs of an adventure-filled day) in the hot tub, while the kiddos splash around in the indoor/outdoor pool. If nobody feels like going out after a long day on the mountain, no worries. The Wild Plum is a well-stocked, onsite market, carrying basic groceries and various beverages, meaning you can get the fixings for a tasty home-cooked dinner in your suite without braving the cold. (Pro tip: if the Wild Plum is missing a crucial ingredient for your crew’s favorite dish, you can ask for a staff member to fetch it from Safeway). Or if you don’t feel like cooking at all, the Wild Plum also makes a mean pizza. The two- to four-bedroom residences have a vibe that’s similar to the upscale-Americana lobby, with elegant furnishings and woodsy accents. The spacious, open common area with a gas-burning fireplace makes a great spot for everyone to kick back and swap stories from the slopes. The fully equipped kitchen features hardwood cabinetry and modern, stainless steel appliances – enough to inspire the inner chef in anyone. The suite’s stylish dining table is suited for casual family meals and DIY dinner parties alike. You’ll find several restaurants within walking distance, but if you feel like exploring a bit you can take the complimentary shuttle downtown. There are all the usual ski town standbys, like fine dining, extensive shopping and numerous art galleries. But in town you’ll also find an array of activities that are uniquely Steamboat – like a soak at Old Town Hot Springs, tubing at Howelsen Hill or a visit to the historic F.M. Light & Sons western store. - Front desk is open 9:00 AM-5:00 PM daily. Guests that are planning to arrive after hours must contact the property using information on the booking confirmation to receive a code to the garage. They will then need to pick up keys from a lockbox located by the front desk.